Sometimes you think something that seems to be a good idea for a few minutes, and then you realize why you shouldn’t do it and move along. Or at least, most people do. However, PediaPress seems to have skipped that last step and instead has set about raising $50,000 via Indiegogo to print out the entire English contents of Wikipedia in 1000 books. Why? I have no idea. Should they? Perhaps not. Just think of the trees. Nonetheless, if successful that’s exactly what’s going to happen – thereby transforming the ever-changing, shareable, easily accessible, editable entries on Wikipedia into, well, 1,000 books full of information that no one will ever read. Ultimately, the aim is to display the 1,000 gray scale-printed books at an exhibition at the Barbican in London in August this year, and if stretch funding is met, take it on tour. This is by no means the first time we’ve heard of someone wanting to print all of Wikipedia, but no one has ever seemed to find a viable way. 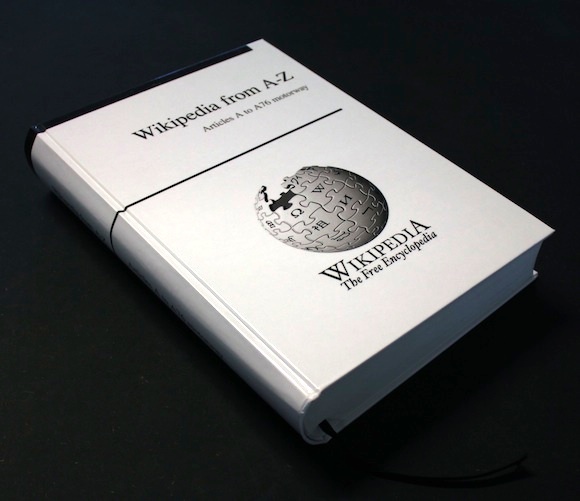 In acknowledgement of how utterly redundant the books will be in a short space of time, the project notes that “obviously a printed Wikipedia will be outdated within seconds. We plan to visualize the update frequency of Wikipedia by printing live updates on continuous paper during the exhibition”. So that’s more trees then. Artistic pursuit or PR stunt to raise awareness for the book printing service operated by the company behind it? We’ll leave that up to you to decide.